has a strong tradition of these institutions. Over the previous six months or so I have visited many of the Welsh clubs, in particular photographing the Saturday night dance. 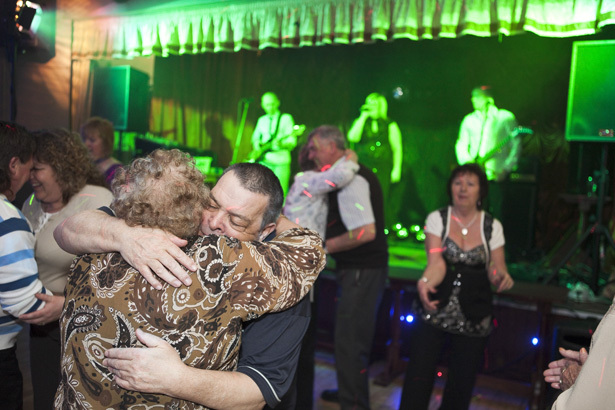 Working men’s club are in gradual decline and are struggling to regenerate by recruiting younger members: currently the average age of members is around 60. Occasionally I came across more progressive clubs. These were the ones bucking the trend by attracting a younger audience and upgrading their appearance and facilities. The clubs are very friendly and were always happy to facilitate my request to take photos. This is very reassuring, as it becomes more problematic to photograph an increasingly suspicious public. Despite the huge variety of clubs the Saturday night dance has many universal features. It is remarkable to see a club transform itself from an all-dancing venue to a brightly lit bingo hall (and vice versa) in a matter of minutes. Bingo is an essential ingredient for the working men’s club. There are other traditions. The bands, usually some form of tribute act, all finish their second set at 11.30pm precisely. Dancing is not encouraged for the first set, the theory being that it is important to watch the band without distractions, but is regarded as de rigeur on the final set. flashing lights, the heady combination of four generations dancing together was, for me, the highlight of this project. An exhibition, commissioned by Safle, was held at Earlswood WMC, Cardiff, between the 11th of February and the 14th of March 2010.